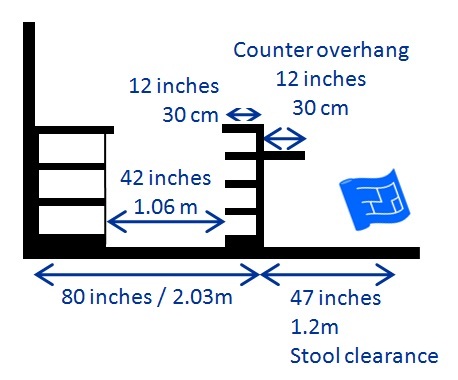 I have spent many happy hours analysing kitchen island designs and deconstructing them so that I can give you a summary of the different design options. When you're considering your kitchen island design it's important to think carefully about how you will use your kitchen island and choose the design options that will best support the way you want to live in your kitchen. On this page we'll first discuss the elements of kitchen island designs. The idea is to talk about the different options available so that you can pick and choose the combination that will work best in your kitchen. The examples are all for rectangular islands but go ahead and use your imagination to apply the principles to the shape of island that you're planning. I've illustrated the ideas as they would appear on a plan from the top down and in section as if someone had cut the island in half. It's a long page so you can skip right to the kitchen island designs or other section that you're interested in. 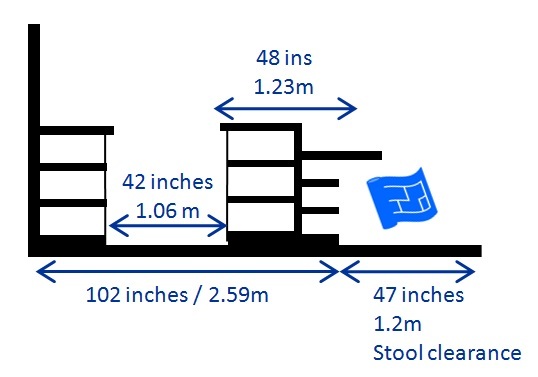 I recommend taking a look at the kitchen dimensions page to familiarize yourself with the clearances that a kitchen island needs under different circumstances. The kitchens with islands page suggests some overall kitchen layouts which include an island. This page is part of the kitchen design layout series. Here are the main elements of kitchen island designs that I played with to come up with the designs on this page. Kitchen island designs are driven largely by cabinet depth. 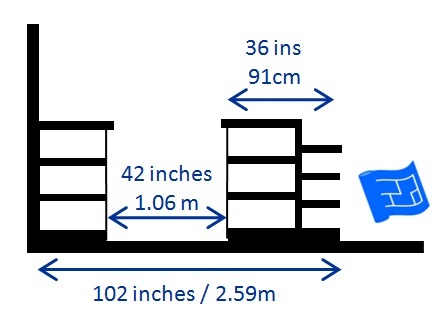 If you’ve ever spent time over on the kitchen cabinet dimensions page you’ll have seen that base cabinets are usually 2ft (60cm) deep. This page includes some options that combine base cabinets and half base cabinet depth. 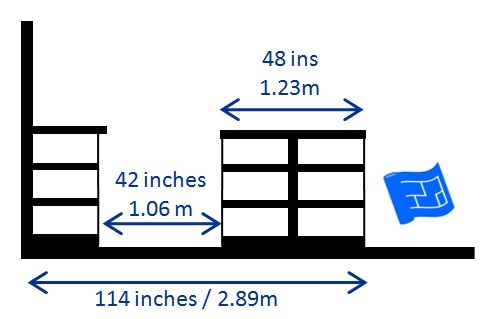 Check with your kitchen manufacturer to see what depths the base cabinets are available in. Sometimes wall cabinets which are 1ft (30cm) deep can be 'hacked' by a good kitchen installer for use as the base of an island. Kitchen islands can be any length to suit the design of your kitchen. 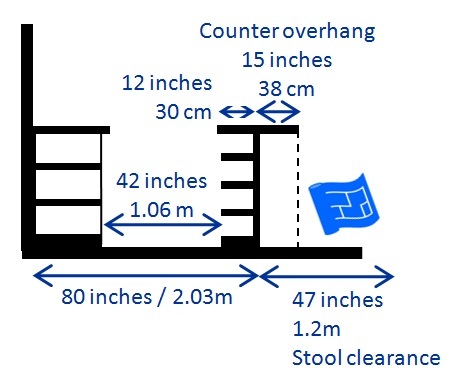 What you need to find out is whether or not there is a maximum length for the material you are considering for your the countertop of your island. 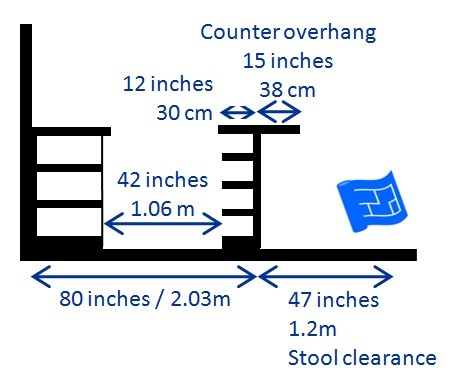 In Europe many countertops can be ordered in lengths up to 3m 20cm. You can of course have an island longer than this but there will be joins involved in the surface material. 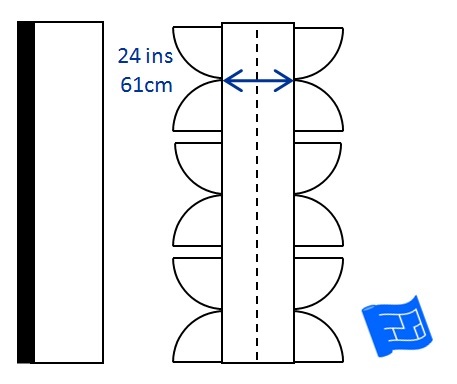 You can make joins less obvious by changing materials and/or changing height. 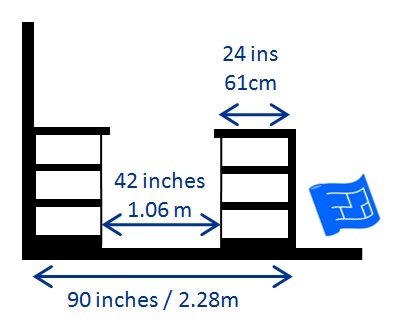 When you're planning out your island think about how you want to orientate the storage. This dictates the door plan. On this page I have included door plans to keep it simple. 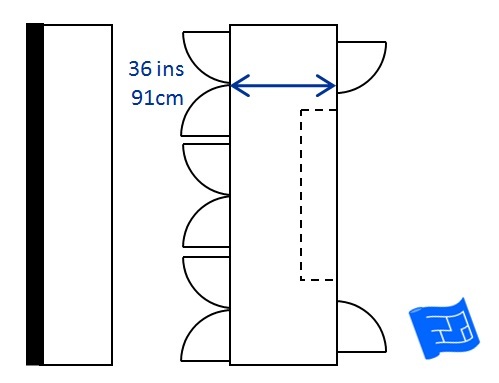 Remember you can have a single or a set of drawers as part of a base cabinet. In the main, all islands will have some surface area at the same countertop height as the kitchen surfaces. 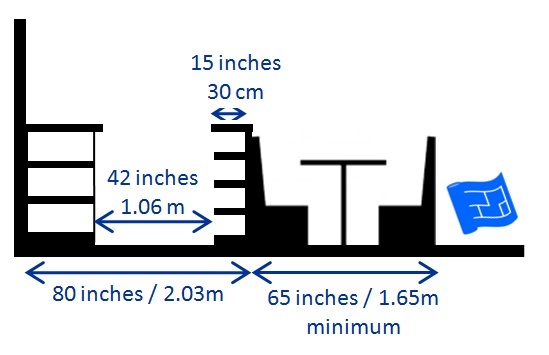 For the part of the island that serves the seating area there are three generally accepted height options which are (smallest to tallest) table height, countertop height, bar height. 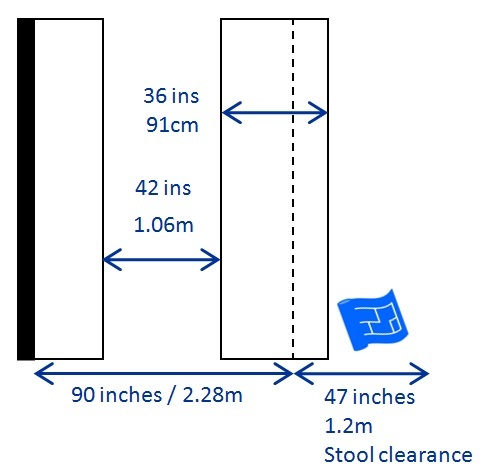 Just remember to buy barstools that are the correct height for the surface height that you choose. 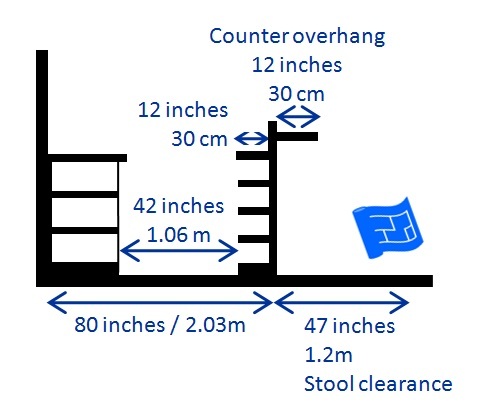 A change in height can be a great way to add a new material to your countertop. Having the whole island at kitchen countertop height (36 inches / 92cm) is a popular option. It gives a sense of continuity and doesn’t create any visual barriers between the kitchen and the surrounding areas. 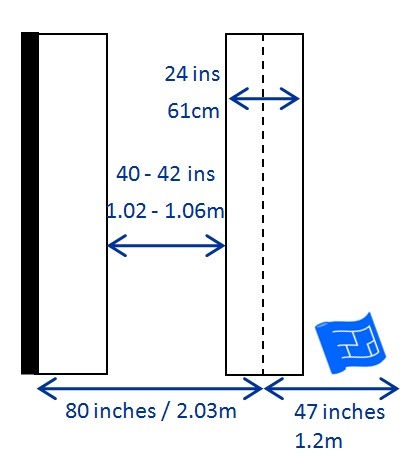 Raising part of the island to bar height (42 inches / 107cm)is also a popular option. The beauty of this design is that all manner of mess can be hidden behind the raised portion so that your dirty dishes needn’t be on display to the adjacent space. Sometimes you want both and island and a table in your kitchen and there isn’t quite room for both. 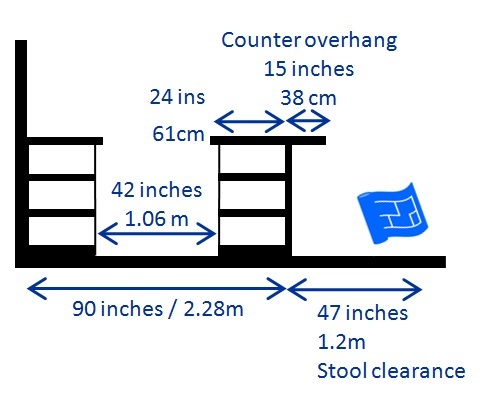 Having a table (height 30 inches / 76cm) as a continuation (albeit with a change of height) of the island can be the solution to this problem. A change in material as well as height can make the table feel more separate from the island if that’s what you want. The first depth option is to make a kitchen island with some cabinets of wall cabinet size. 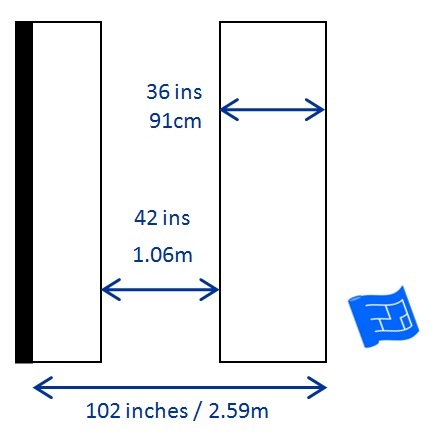 Check what depth of base cabinet is available from your kitchen cabinet manufacturer. Here's what a 1ft / 30cm kitchen island design would look like on the floor plan. It’s fair to say that this would be a very thin kitchen island. In fact it serves more as a space divider rather than an island as such but it does still provide a useful surface which can augment the counter space in a kitchen. Since it’s thin, it needs to be bolted down to the floor very firmly to prevent it falling over. I have come across kitchen islands of this depth in several configurations. We'll take a look at them now. Here's the 1ft deep island in it's simplest form where the shelves are facing the kitchen and there's a flat countertop with no overhang apart from the lip that extends over the cabinets. Then if we just spin the island around the shelves face away from the kitchen providing some storage to the living space. 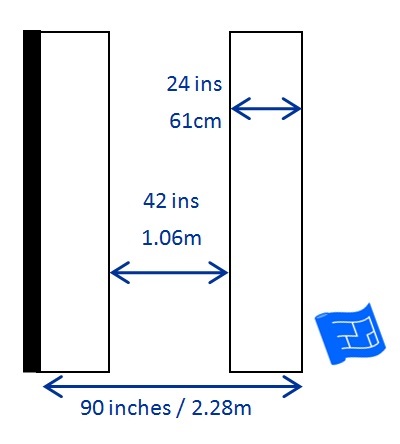 The next design element that's added here is a vertical divider. In the first example, the divider shields the countertop (hides any mess) of the island from the area beyond the kitchen. 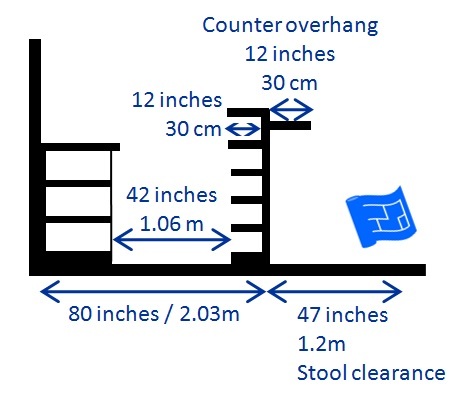 Equally, this arrangement can be reversed to present the shelves and the countertop to the area beyond the kitchen. 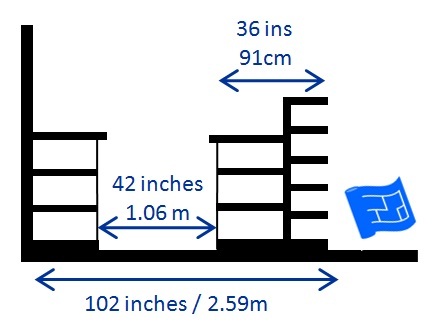 If we play with this arrangement we can make the shelves available for kitchen storage and the countertop directed to the space beyond the kitchen. 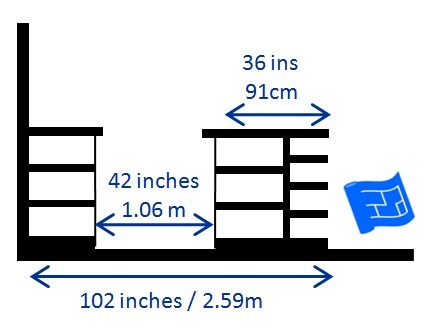 And if we reverse this we have the shelves available for storage outside the kitchen and extra countertop space available within the kitchen. Another way of creating a visual barrier is to raise the height of the island itself to bar height. There are a few different configurations for doors with a 1ft / 30cm kitchen island. The most obvious is with all the doors opening towards the kitchen. Or if storage is more useful to the area outside the kitchen, the doors can be placed on the other side. Or you can choose an arrangement using both sides. Here's a space saving idea. How about building a bench on the back of your island? The next size up is to make an island out of a run of base cabinets. Here's what that would look like on the floor plan. 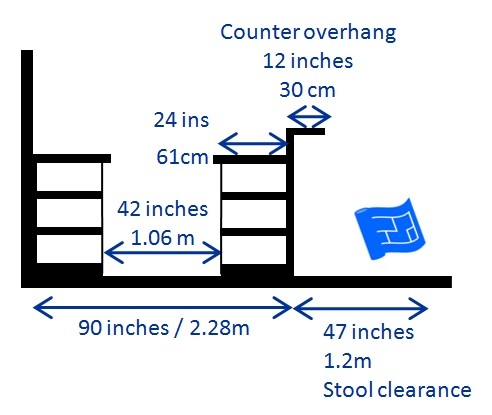 A divider can be added to prevent the countertop being used as a set down place for the area outside the kitchen, and to shield the view of the kitchen. Another surface at bar height can be added to overlap the surface of the island to give more counter space. All the examples above have the shelves facing in towards the kitchen, but you can choose other configurations. First of all, here's how the doors would look with all the shelves facing the kitchen. You could opt to have some of the shelves facing out into the area beyond the kitchen. How about incorporating some storage at the short ends of the island? 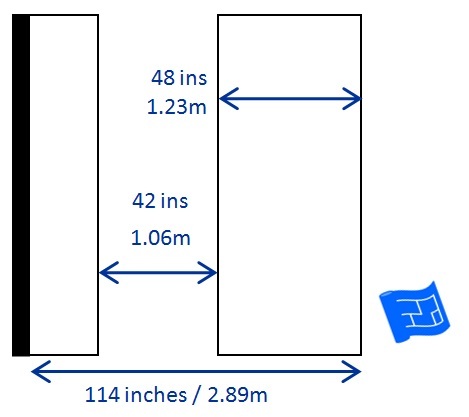 Another alternative is to half the storage depth and allocate half to each side. 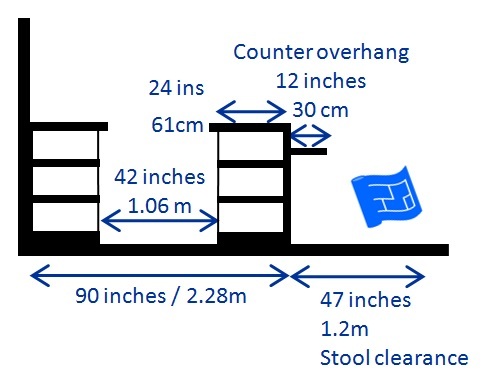 Now let's look at 2ft / 60cm deep kitchen island designs that include the use of 1ft 30cm base cabinets in order to create an overhang which acts as legroom for seating. 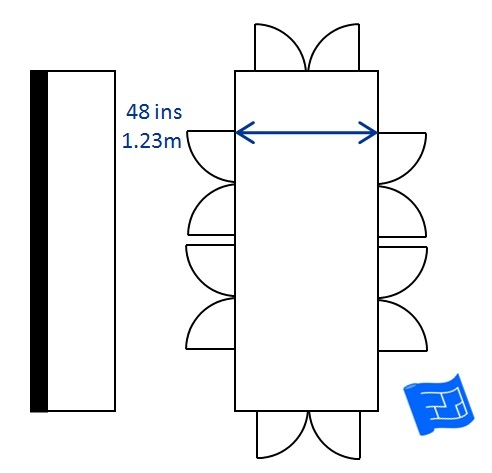 The dotted line in the plan view below shows a 'cut out' area that is created by using 1ft / 30cm cabinets along that section. 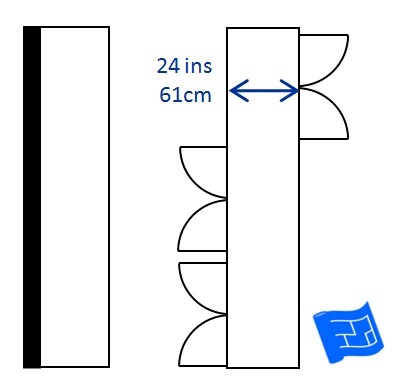 Let's have a look at this in section view. Another option is to have an overhang the entire length of the island. And in section view below. Now, you can see that the total depth of this island is slightly greater than 2ft / 60cm. 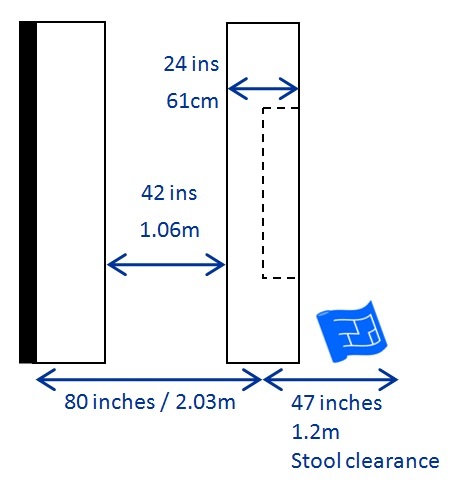 Strictly speaking to allow for the most comfortable clearance for seating an overhang for 15 inches / 38cm is required. 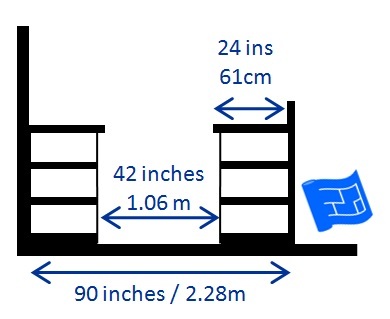 How about turning the shelves to present to the area beyond the kitchen? 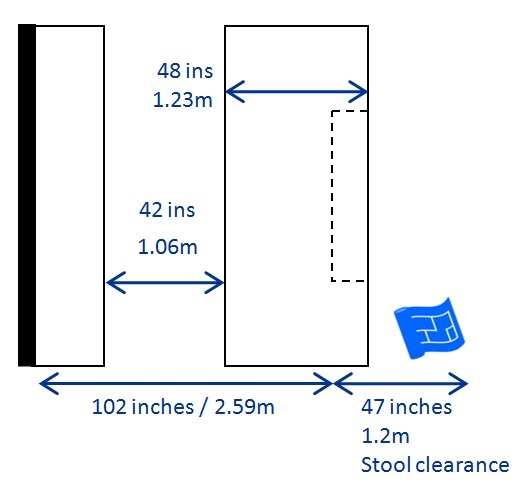 This can be a little bit impractical because stools have to be moved to access the storage, but if there is already enough kitchen storage, it might make more sense to orientate the storage this way. 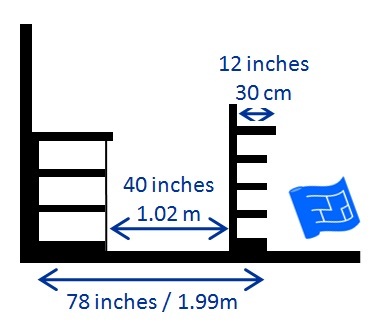 There are options with the surface height of the seating are as well. 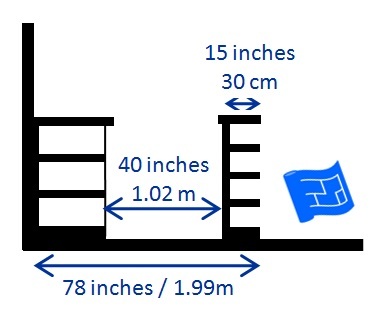 You can take the surface height to bar height which would create more of a barrier between the kitchen and the area beyond the kitchen. The vertical edge at the back of the 'breakfast bar' is important to avoid objects being accidentally pushed into the kitchen side of the island. 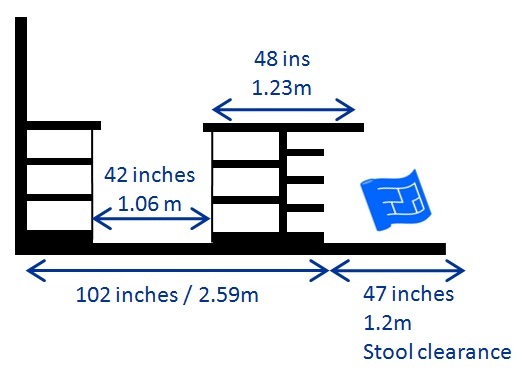 Equally, tabletop height is another option for the surface height of the seating area. 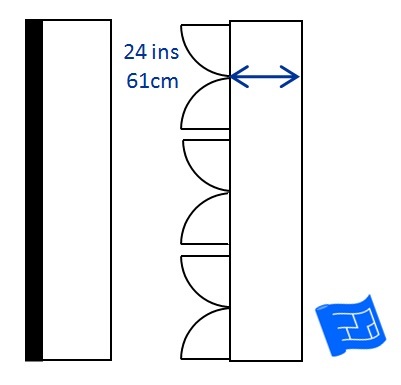 Another idea worth considering is including some overlapping surfaces. 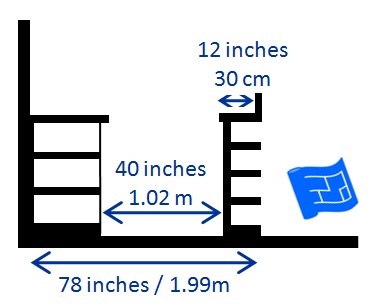 In the example below the surface height of the seating area is at bar height. Another shelf has been added on top of the divider which increases the flat countertop space available. 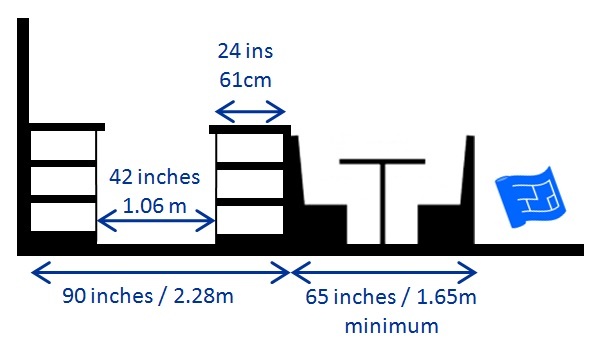 Section view of a 2ft / 60cm deep island with seating area countertop at bar height, plus an overlapping surface on the kitchen side providing more countertop space. 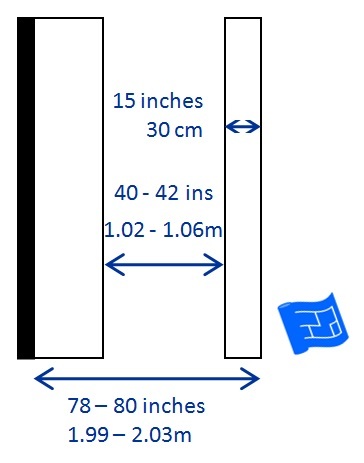 A booth built on the back of a 2ft / 60cm island would need an additional 65 inches / 1.65m. One of the decisions to make about kitchen islands is what to put at the ‘thin’ sides of the island. Is it better for your kitchen design to have the storage opening only along the length of the island, or does it make more sense to have cabinets opening along the thin edge on one or both edges? How about an overhang for seating on the edge of the island? Now we move along to 3ft / 91cm deep islands. Here's what that would look like in plan. If you choose to make the island entirely storage you can pick which side has the deepest cabinets. 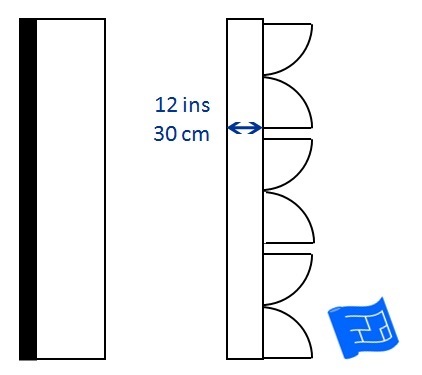 The dotted line represents where the storage is split. 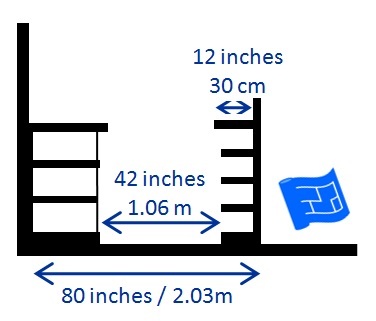 Here's a couple of other arrangements on the theme above with varying surface heights for the countertop heights for the area beyond the kitchen. First let's look at what table height looks like. Or the storage could be the other way round. Perhaps the most popular arrangement for a 3ft / 91cm deep island is to use base cabinets and eave an overhang to create a seating area. Let's have a look at what that would look like side on. 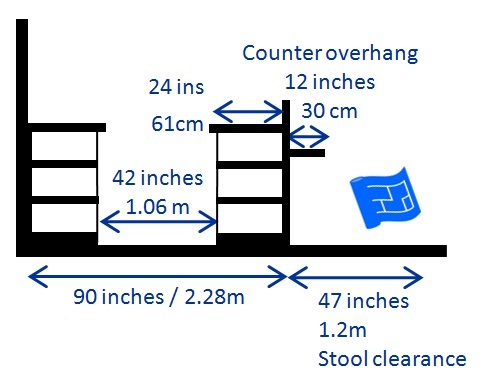 As we saw earlier the most comfortable clearance for seating an overhang for 15 inches / 38cm is required. 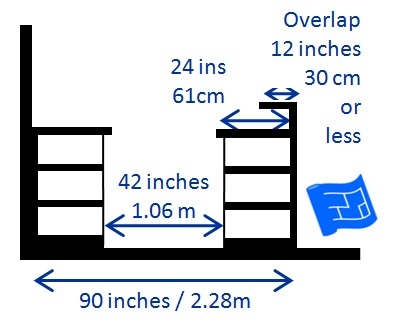 Of course you might find that changing the surface height of the overhang will work better for you. 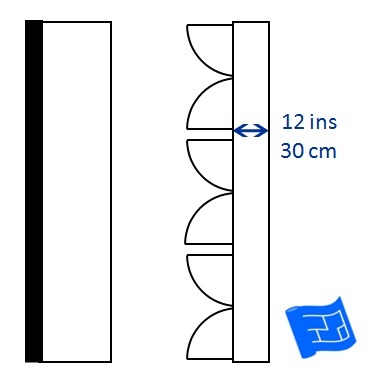 How about adding a divider? Let's see what an overhang at bar height looks like. Another alternative is to include a cut out area in the island for seating. 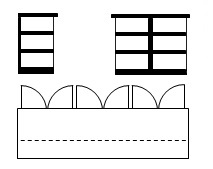 Here's a door plan for the arrangement above. This is obvious in hindsight but when you're designing your island, or any other part of your countertop for that matter, make sure that you will be able to get in into your kitchen. 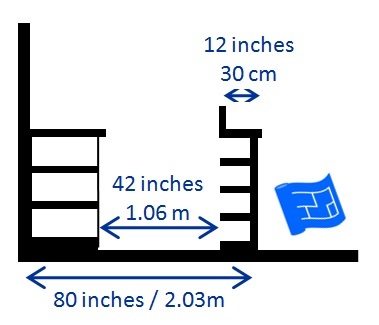 Make sure it will fit through the door, and if you're in an apartment will it fit up the stairs or in the lift? In this arrangement base cabinets are used on both sides of the island. This is how this depth of island looks from the side. 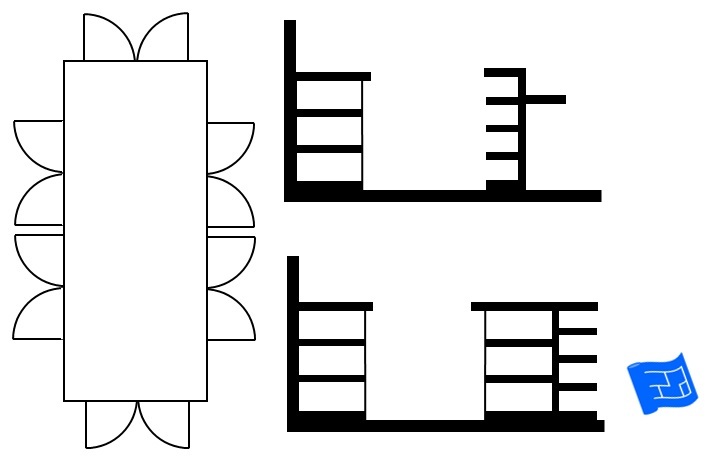 Here's a few door plans for the above arrangement. 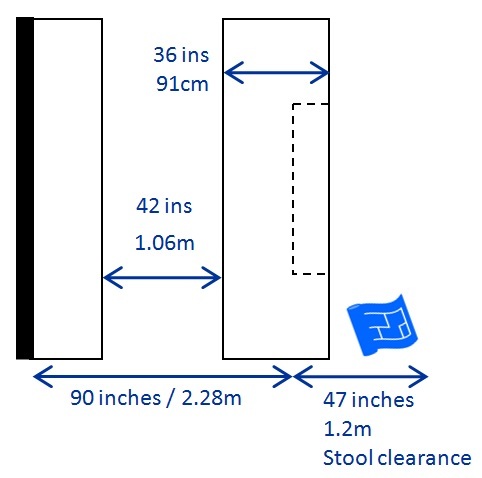 If seating is required, a slimmer cabinet can be substituted on the appropriate side for the length of the run of the seating. Let's see what that looks like from the side. 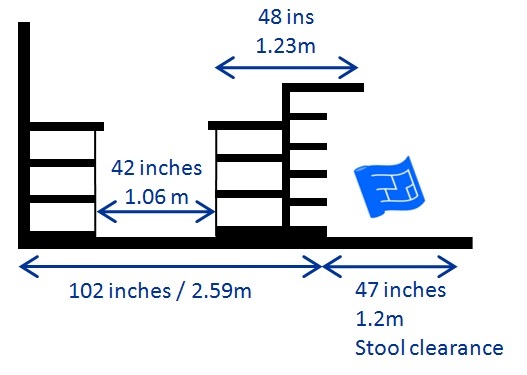 You can choose to have the surface height of the seating area at a different height to the rest of the island. In the example below, the counter for the seated area is at table height. 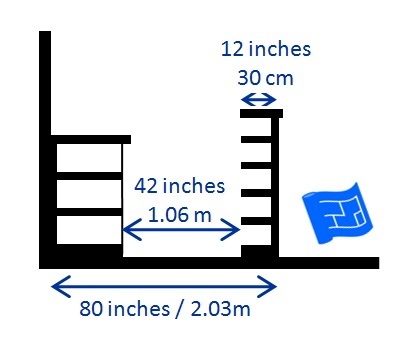 Another option would be bar height. 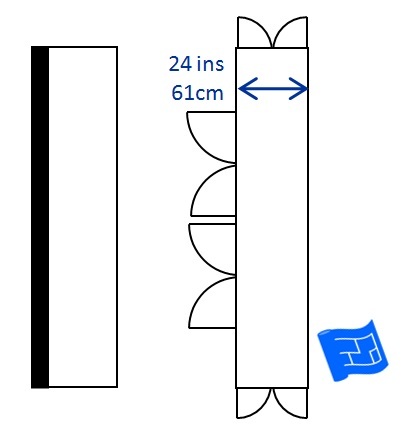 Or you can decide to have a cutout seating area. Deeper kitchen islands are of course possible, but it leaves a dead space in the middle of the island. If you have plenty of space this isn’t a problem. All the examples above have been for a rectangular island, so let's explore a few other options for kitchen island shape. 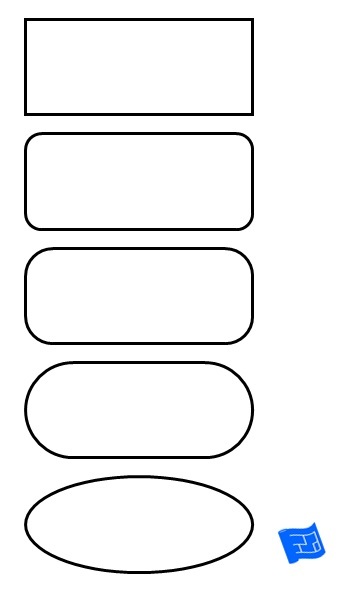 In the picture below the shape of the island become gradually more curved. When it comes to cabinets, curves generally mean more expense. Some manufacturers will have curved cabinets available as part of the range in which case you could have a kitchen island design with a straight edge and rounded at the ends. 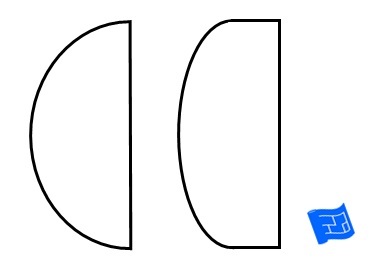 A full oval shape would be very expensive to build and is likely to require custom cabinetry. Generally, the more curved your kitchen island design, the more expensive it will be to build. Now let's look at an island that's curved on one side. The thing about curves is that it's often only possible with custom built cabinets if you want to include cabinets along the curved edge. If you're not going to go to the expense of custom cabinets then a good trick is to have one side of the island in a shape that's suitable for off-the-shelf cabinets, then you can get the countertop of the island cut to include a curve. 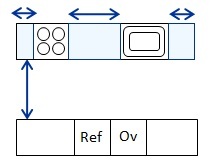 Below, this is demonstrated in the right hand example. 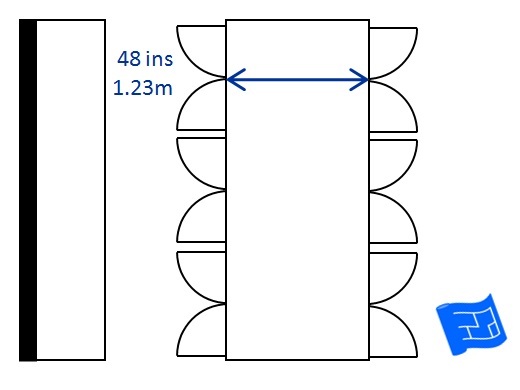 Two options for a curved shaped kitchen island. 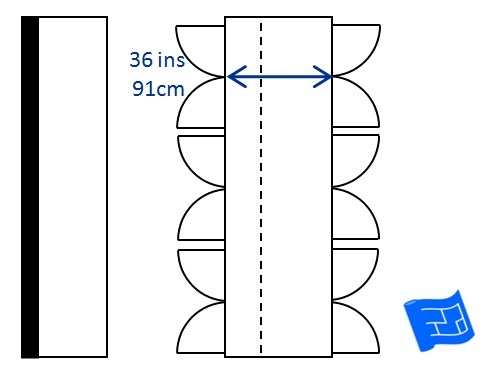 The example on the right is more suitable for off-the-shelf cabinets. Similar logic applies if you need a triangular shaped island to deal with an angle in your kitchen design. 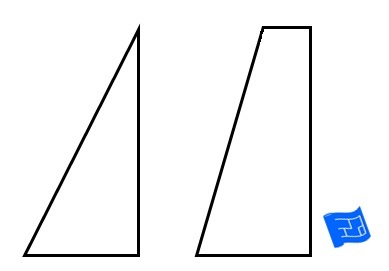 Two options for a triangular shaped kitchen island. 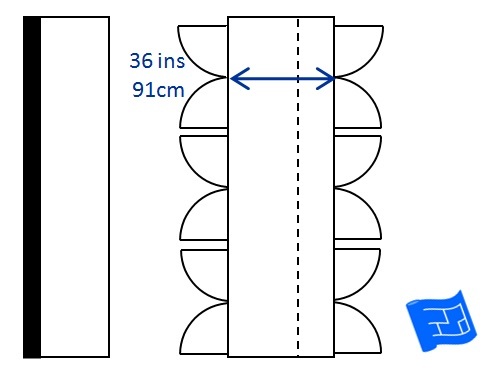 The example on the right is more suitable for off-the-shelf cabinets. There are some options for the power sockets on your island on the how to design a kitchen page. And don't forget to check out the kitchen lighting ideas page to see how your kitchen island lighting can contribute to your kitchen ambience.